"Here are tales of foxes along with the history of the 'fox traps' of Lakeland which is as inpenetrable as the Lakeland mist which often covers them. The date of construction, how they were actually used and why remains a mystery. 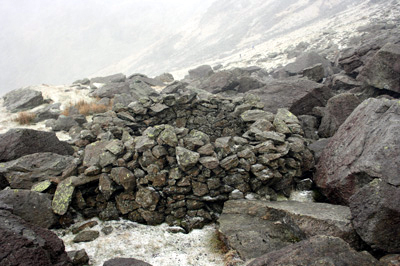 "Slumbering high on the Lakeland fells, it is no fault of theirs that due to changing times, they may be at risk from those opposed to hunting and determined to eradicate the memory. For that reason no references are given; they deserve to be left in peace. All are in some form of dereliction. Time will inevitably destroy them, which is as it should be." "Ista garn t' watch t' cubs?"